I don’t know if you can ever be ready for the rain, the mud and the damp. 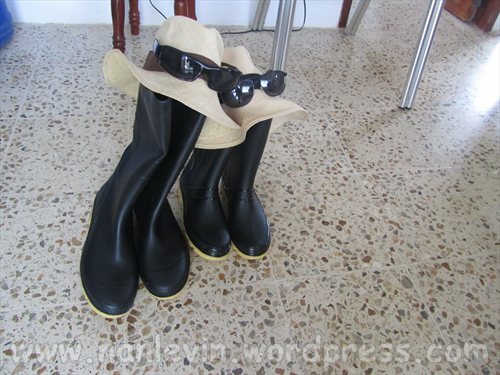 But Joe and I did go into Portoviejo and found ourselves a great pair of boots. We have been told by our friends and neighbors John and Mary MacDonald that when it rains it will become so muddy you will have mud up to mid-calf. If you plan on walking around town almost anytime for the next several months you will need something besides sandals. I know we got a bit silly with the hats and sun glasses but we will not be walking in the rain just in the mud left over from the rain..so now you understand the hats and sunglasses! We tried to buy the boots here in San Clemente at Casa de Todo but she did not have any boots in stock. We do try to buy as much as we can here between Clemente and Jacinto our next stop is Charapoto trying to keep our money in this area instead of taking it to Portoviejo, Manta or Bahia. Many times that has worked for us. It has rained several times over the past two weeks. Some days it has sprinkled almost all day long making it impossible to get your laundry to dry on the line. This week I plan on doing all the shopping early in the week that we will need until after carnaval. It will be difficult to get around town with as many as 20,000 more folks here celebrating for that entire week starting Thursday, February 7 until Fat Tuesday, February 12. So it is a great time to enjoy our porch and yard. 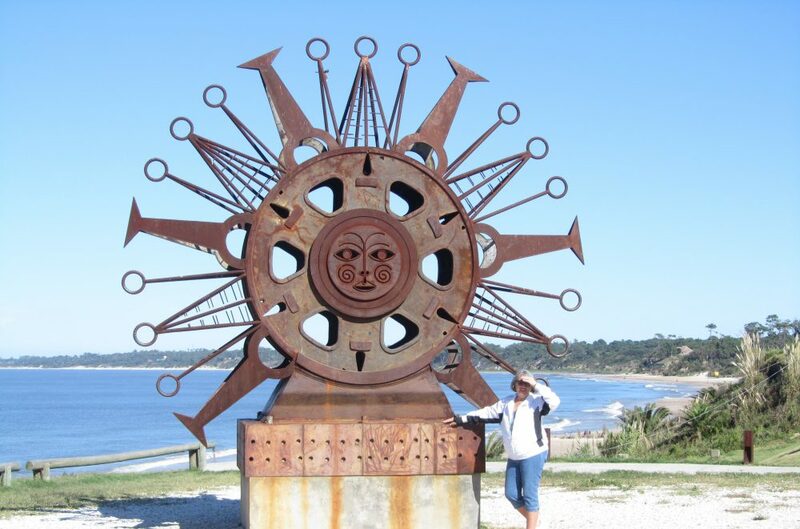 This entry was posted in Beach, Carnaval, Ecuador, San Clemente and tagged Beach living, Ecuador, Expats, San Clemente, South American by Nancy Levin. Bookmark the permalink. Hmmm, We’re going to be there in 2 weeks, so boots are recommended? Do you know if we could find some in Guayaquil? We’ll be there for a day before we hop on the Reina del Camino. Actually I have another question I’d like to ask you, since you are a San Clemente ‘native’. Do you wash your fruits and veggies, and if so, with what? We’re only there for two weeks, so don’t want to spend most of it in the bano! Hi Marilee, If you plan on walking around the streets in any of the small towns I would recommend at a minimum a good pair of waterproof sneakers, you can find rubber boots in the big cities so yes to Guayaquil. What we have found is that the main streets will be paved but the side streets are just dirt. Ours has a layer of big rocks and then about three months ago our neighbors got the municipality to bring in some pea-gravel which they spread over top…there are still some low spots that retain water but this is one of the best side streets in town…all thanks go to the men of this neighborhood. Hi Nancy – Thanks so much for the response. Actually we will be in San Clemente for two weeks (staying at Vistazul) arriving on Feb 22. We’d love to meet you for coffee or something. Should we just look for the pink bike? LOL We are planning on bringing some GSE with us for frutas y verduras but finding rubber boots here in winter is a bit of a stretch. Since we’ll be in Guayquil for one day, we’ll definitely get them there. Thanks for the tip!! love that picture! enjoy carneval!